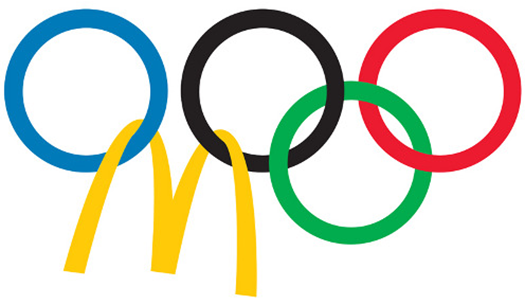 McDonald’s is pulling out of its top level Olympic sponsorship deal, effective immediately. It will continue as a lower level sponsor through the 2018 Olympics, though. McDonald’s has been associated with the games since 1968, when it famously airlifted hamburgers to US athletes, in Grenoble, forced to subsist on French cooking. Usain Bolt endorsed McDonald’s in Beijing. The pullout leaves on the table the powerful and unsolicited endorsement of Usain Bolt. He said, during the Beijing Olympics, that he had ingested a thousand Chicken McNuggets over the course of the games because he couldn’t stand Chinese food. High praise indeed, considering he won three gold medals with all that food in his McStomach. The hamburger colossus is cutting short its eight-year, $260 million sponsorship deal, with three years left to run. McDonald’s wouldn’t say what had prompted the move, only that it was “reconsidering all aspects of our business.” Although it may not see much if any of that money back, it will sure as heck save itself a great deal of money in associated marketing costs, which it can deploy elsewhere. The Olympic pullout doesn’t come as a complete surprise as rumours had suggested McDonald’s was not particularly happy with the Olympic organization. However, the rub goes both ways. Many people didn’t like the idea that McDonald’s was associated with the Olympic industry, in the first place. The connection between high performance sports and eating burgers and fries, at McDonald’s, is either tenuous, non-existent or downright misleading, with the exception of Chicken McNuggets, of course. I guess that’s the problem when you’re the fast food industry leader: you get a target put on your back and you get whacked for associating with athletes, for marketing to children and for all the shortcomings of that industry. In fact, circumstances have gotten to the point where McDonald’s may not be able to find a suitable big-world event willing to accept its sponsorship. It might have trouble if it sought to sponsor the United Nations or one of its agencies. The Pokémon World Championships may not be interested, nor would the College of Cardinals. Perhaps McDonald’s might propose to look after Venezuela, in its time of need. Perhaps it could sponsor the 2018 World Chess Championship. Both chess and McDonald’s are big in Russia. McDonald’s might especially consider sponsoring a celebrity match between Vladimir Putin and Donald Trump, who, ostensibly, is a fan, even though he doesn't play, which Trump would win because he is a winner. Chess masters would scrutinize the game for years afterwards, trying to figure out how or why Putin could have made such bonehead moves. His posthumously published memoirs would reveal he did it for the good of Mother Russia. Perhaps McDonald’s should stick to its knitting for a while. According to its public filings, McDonald’s Corporation wants to be an “informal eating out” establishment, as opposed, presumably, to a ‘fast food joint.’ Thereby, it would find a position a notch above its competitors. McDonald’s has a plan to retain existing customers by targeting family occasions and breakfasts and by “transforming the experience,” in the restaurant. To regain lost customers, it plans to make “meaningful improvement in quality, convenience and value.” To convert occasional customers into regular customers, it plans to tackle the “untapped demand” for coffee and snacks. Thus, while it is reviewing all aspects of its business, it nonetheless has a plan for moving forward. I can see the scenario under which McDonald’s will earn its social licence by noting that we all have to eat; that we’d prefer to eat out sometimes and that we might choose to do so casually, all the while feeling we’re eating a quality product, made ethically and priced fairly. Even if I’m trying to choose between a fresh salad stuffed with yummy kale and a Big Mac. After much agonizing I choose the latter, I don’t have to feel so guilty about it that I can’t enjoy my meal. Moreover, it’s already earned plenty of goodwill with its charities for children, local sports sponsorships and commitment to responsible energy conservation, packaging and sourcing. Watch out, Usain Bolt! Once I’ve a thousand or so of these babies under my belt, I’m coming after you. Don’t tell me you’re retiring because you hear my footsteps.